Do please come to an event I am doing with Liliane Lijn and Richard Norris at the October Gallery at 3pm on January 17, alongside their current Burroughs exhibition. Liliane and I have worked together a couple of times (see Art and Science at the Beat Hotel, and Atomanotes) while Richard and I first performed ‘A Porky Prime Cut’ together for the Free University of Glastonbury in the 2011 Glastonbury Festival in a collaboration that was put together by the brilliant Mathew Clayton. It will be great fun to do that again. Liliane Lijn met William S. Burroughs at the now legendary Beat Hotel when they were each exhibiting in Paris in the early 1960s, while author Tony White encountered Burroughs’ work as a teenage art student in the early 1980s. These encounters are still being traced and articulated in each of their works. From collaboration to ‘control’, conversation will range from Lijn’s first meeting with Burroughs that led to her kinetic sculpture Way Out Is Way In Poemdrum (2009) — which is being exhibited for the first time in London at the October Gallery as part of William S. Burroughs: Can You All Hear Me? — to White’s use of the Burroughsian satirical routine in his rare, cult police novel CHARLIEUNCLENORFOLKTANGO (1999). Readings will include an excerpt from Lijn’s epic feminist prose poem Crossing Map and ‘Electron Notes’ her cut-up statement written in 1964 and published in Signals that year, and ‘A Porky Prime Cut’, White’s tracing of impacts of the first UK TV broadcast in 1983 of Howard Brookner’s seminal documentary Burroughs: The Movie, in his story about Throbbing Gristle fans, Bournemouth soul boys and the birth of acid house. ‘A Porky Prime Cut’ will be performed with a live musical accompaniment by UK acid house pioneer and former Psychic TV collaborator Richard Norris. 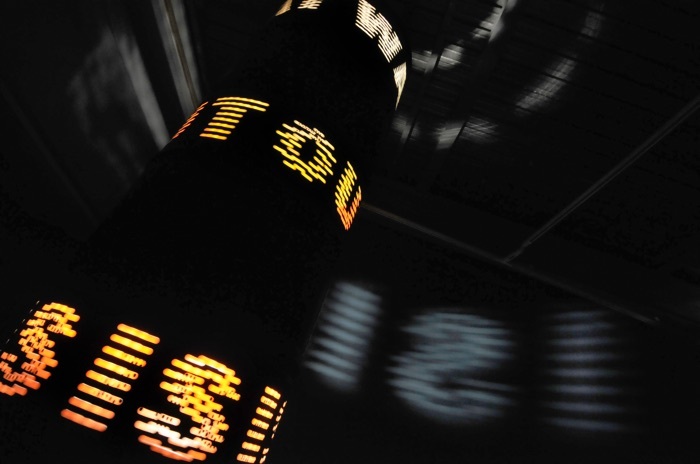 Liliane Lijn, Way Out Is Way In, 2009. Painted steel solvent drums, 3 phase motor, inverter & programmed speed & direction control chip, halogen lighting 300 x 60cm. Photo © the artist. October Gallery, London: Saturday 17 January 2015, 3pm. Admission £7 Concessions £5, Book tickets here. Read more about Minutes To Go, Years Apart — readings and conversation with Liliane Lijn and Tony White, on the Art Update website. Tagged with A Porky Prime Cut, Beyond the Wizard's Sleeve, Brookner, Burroughs the movie, charlieunclenorfolktango, Crossing Map, Jack the Tab, Liliane Lijn, october gallery, Richard Norris, Signals, The Grid, Throbbing Gristle, Tony White, uk acid house, William S. Burroughs, william s. burroughs: Can You All Hear Me?